Are you looking for an LMS that delivers the total package and allows you to create, deploy, and track your online training all-in-one? In this article, I’ll discuss the top 10 build-in authoring features to look for in your next Learning Management System. This post was first published on eLearning Industry. How can I register for the Captivate eLearning Conference workshop in Orlando Florida? The post Conference Workshop appeared first on eLearning. As you might be well aware that, besides many, there are two very similar looking Actions that can be used to control & manipulate our Application created in Captivate. program. Advanced Action & Shared Action. Every developer has different opinions on whether Advanced Action is better or Shared Action. And the fact is both have pro & cons. We are not going into that debate. Here, I am demonstrating Shared Action to achieve additional functionality in our Quiz, that is lacking in the Captivate Quiz. What any would expect that, after Module completion, Learner would give an exam(Quiz) and at the end of the Quiz, he/she should get explanation about why his/her answers were wrong & the system’s Correct answer is only correct. That is achieved in this tutorial by using ‘Shared Action’ where after completion of the exam, in review mode, each and every question are shown with an explanation to the correct answer. Add two shapes in a question slide as shown below. Create shared Action as shown below. Test this action script by applying to any one question slide. That is, Apply Shared Action to ‘On Enter’ Event of (any)one Question Slide and test it. Once it works fine, Save it as shared action. 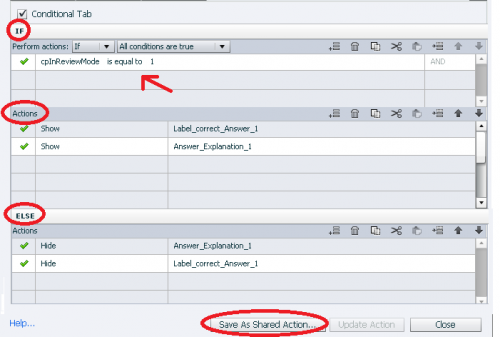 Now use that shared action for all question slides and just two parameters for the shared action in each question slides. See Demonstration below & then Try it. Note: Worth to read following articles posted by Lieve Weymeis (For Those who want to know more about Shared Action). The post ‘An Explanation to Correct Answer’ in Review mode of Quiz Using ‘Shared Action’ appeared first on eLearning. Captivate 19 screencasts have no audio when playing on iPad/iPhone. Why? Codec? The post No Audio on iPad/iPhone appeared first on eLearning. Hello. I am attempting to modify a lesson produced in Captivate 9 that works fine but now I need to add audio. I don’t want the “Next” button to appear until the audio is finished. One the first slide where I’ve added audio using the text-to-speech option, I have the next button appearing as desired near the end of the audio playback. However, on any other slide, I can’t get the Next button to appear at all after expanding the timeline to make room for the audio. The Next button has all the same properties and is configured to appear 20 seconds after the slide starts and pause after 2.5 seconds to wait for the user to select the button. This is timed well with the audio and gives the effect I’m after. Playing the slide in the editing interface suggests is should work just fine; the Next button appears as expected. However, when published to an EXE file or to an HTML5 product, the Next button simply NEVER shows up! I’ve built a quick 3 slide test and in that setting it works as expected when published. But in this real lesson, full of graphics, text, and now audio that stretches the timeline, it fails totally. There are no other actions in the project that hide or show these navigation buttons. I am simply trying to rely on the timeline to show the button at the right time. Can anyone please suggest a cause and even better, a solution to this? The post Captivate 9 Timeline Issue appeared first on eLearning. Hello Captivate community. I do have a question regarding chroma key functionality. Can videos of product shot with a green background and imported into Captivate be composited so that the slides background appears? If so, what is the process in CC 2019? Thank you for your replies. The post Green Screen Video not shot with webcam appeared first on eLearning. The post Work sample/showcase appeared first on eLearning.